I am super excited to show you my project for the Great Impressions Blog. This week we are showing you fun summery creations that you can use your stamps for! 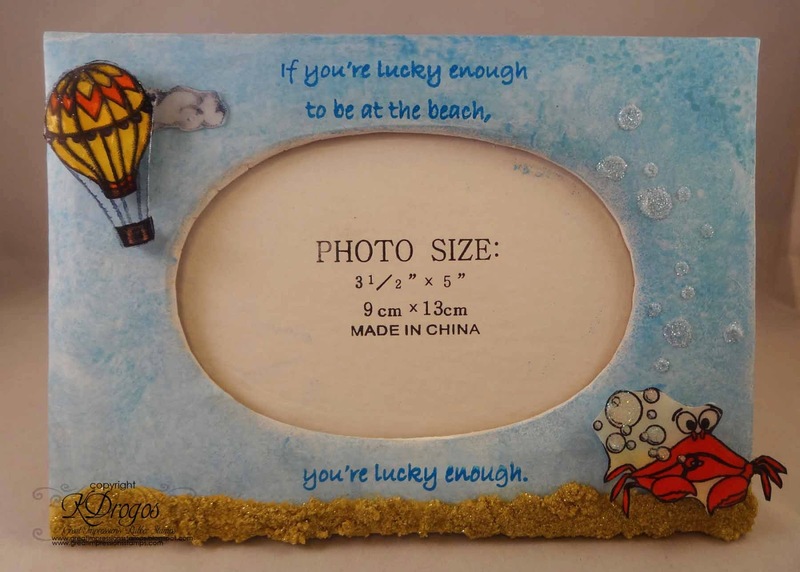 I used 3 stamps to make this beach frame. 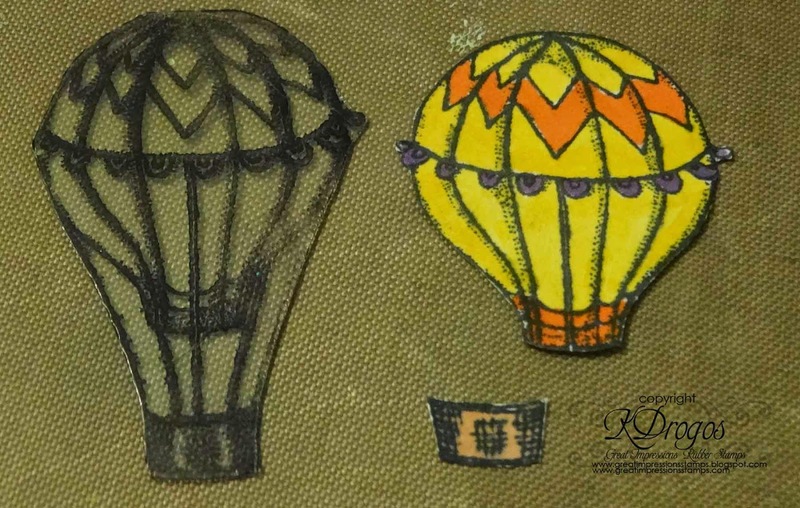 They are: F549 Hot Air Balloon, D421 Lucky Enough, D404 Blowing Bubbles. 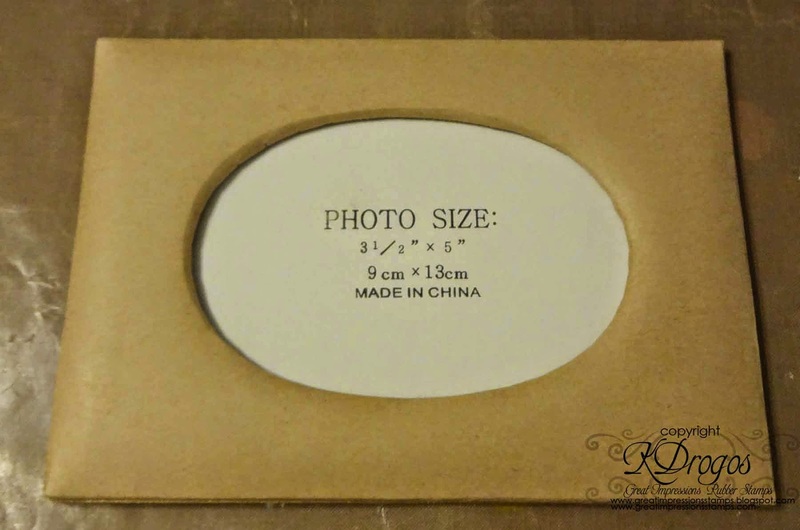 You can find these and other awesome stamps at the Great Impressions Online Store! This is how the frame started. It's a paper mache frame from Joann's. I didn't take any pictures of how I did the background. I used Distress Paints Broken China and Salty Ocean over the whole frame. Then I made sand. I used Tim Holt'z technique here to make it. I substituted a couple of items on the recipe-due to brands. But if it said glitter I used glitter. 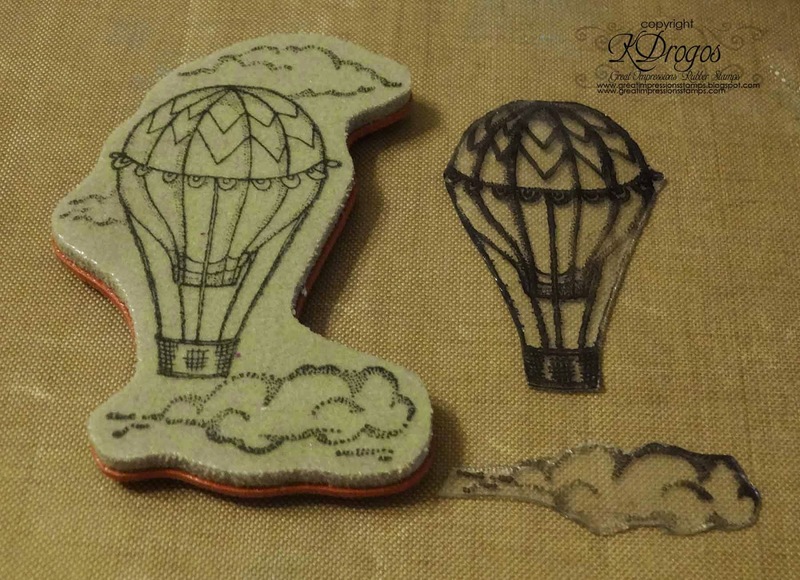 However, I did use the antique lined distress embossing powder because that is a main component in the sand making. 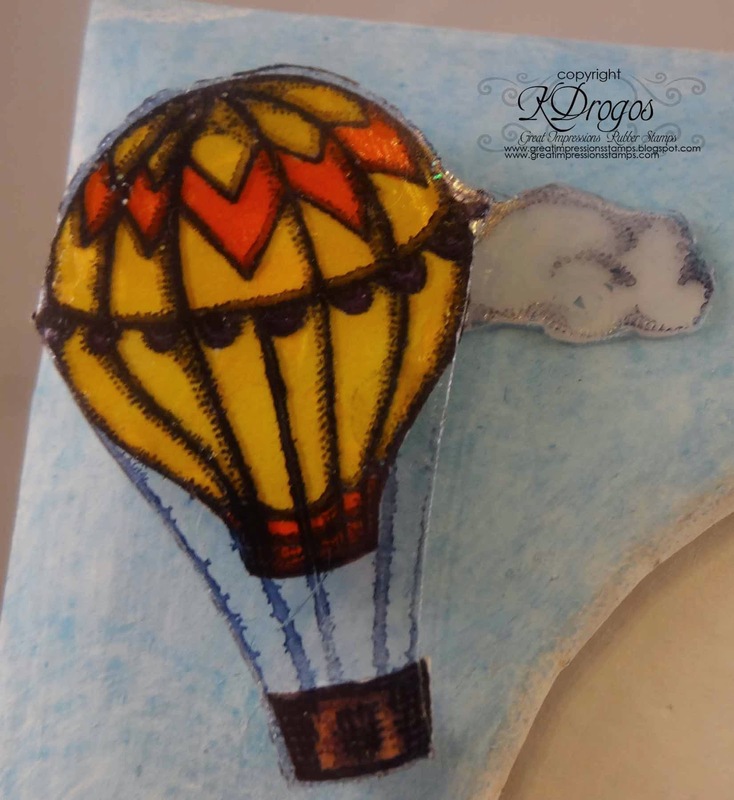 I stamped the hot air balloon on acrylic with Ranger's Archival Ink. I cut out the balloon and one of the clouds. I wanted you to see the the difference between the original stamp and the parts that I used. I also stamped the balloon on white cardstock and colored it with Copics. I cut out the balloon and the basket. 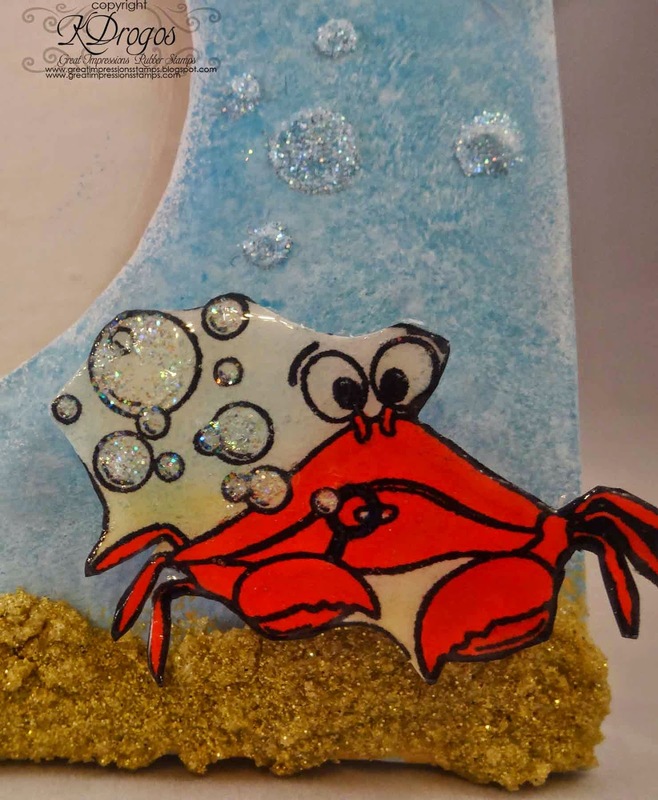 Here is this super cute crab blowing bubbles! I colored him with Copics and used salty ocean and scattered straw distress ink in the background. I used Stickles on his bubble and when those were dry, I fussy cut him out of the cardstock and covered him with Glossy Accents. The other bubbles are from a Heidi Swapp stencil, transparent embossing paste (by Wendy Vecchi) and some Stampin' Up glitter sprinkled on top. I would like to submit this beachy frame to the Simon Says Stamp: A Mid-Summer's Challenge.